A favored consort of the Empress. This Outcaste, raised here, drew the attention of the Empress who took him as her lover. Their child, Adaika, grew to found her own Dynast House some five hundred years ago. However, it was eventually snuffed out by a coalition of rival houses almost two hundred years later- yet another Dynasty forgotten and lost in the Blessed Isle. The Akias are the family who bear most strongly the heritage marks of the Painter Families: raven hair, gold-dappled eyes, and skin pale but also flecked with gold. The populace of Cascading Flowers views that blood with suspicion, believing them bearers of a taint and curse. Some suggest that the ancestral Painters aided the Wyld when they assaulted Creation. That historical suspicion has resulted in the five Painter Families being the only ones in the region still bearing any trace of those ancestors. Of the families, the Akias has always kept to their old ways, making them an object of hatred from the other families. This rivalry was especially strong with the Wailingsong family who hounded them, nearly destroying the line until Akias married into the line of the Magister of the City. This alliance of interests brought Akias influence. However, that strength and their ties have grown more distant. Today, with the Wailingsong family on the rise, they may end up extinguished. The Akais have always been masters and specialists with screen paintings, a form that has also fallen out of favor. One of several festivals unique to Crux and Cascading Flowers Kingdom, the Bed of Sorrows rituals take place just before the Calibration each year. At this time, celebrants think long and hard on what they wish to be rid of from the previous year: bad habits, painful memories, a skin condition, regretful love, and so on. For each thing a person chooses the appropriate flower or plant representing it. They then place these just outside their door the night before Calibration begins, tied with a piece of string colored to match their hope for the coming year. Even the lowest beggar will gather something up to place outside their hovel. The spirits of the land accept these flowers and plants as offerings and each year a small portion of the lesser spirits are given the task of aiding the wishes of a select few. The days leading up to the Bed of Sorrows Festival are joyful, with food, dancing and songs to commemorate the year past and lift the spirits of the people higher. However, the last day is more somber. No bright colors are worn, meals are simply prepared, and some believe the more you speak on that day, the worse your coming luck will be. Children often poke and taunt each other trying to break silences. The Festival is beloved throughout the region and its continuance was one of the terms of the Kingdom’s charter with the Scarlet Empress. Merchants who have to supply the various plants and flowers necessary for proper celebration love it as well. At the end of Calibration, a paired ceremony to Bed of Sorrows in celebrated at Blossoming Pearl, though elsewhere people generally have an auspicious meal. This festival- called the Blooms to Come Pageant- is said to be fantastical and wondrous for those who can make the trip. Though she rarely spends time in Crux, preferring the pleasures of Blossoming Pearl and the Court, the influence of Calm Wing is felt everywhere. Born to a skilled merchant family, she learned her numbers early on and graduated with honors from the Three Wisdoms' Towers (an experience she does not readily discuss). Her talent showed itself in an uncanny ability to observe and guide the market, a ready sense of applicable risk, and a mastery of exchanges. Rather than serving as merchant herself, she began to back and offer patronage to offer merchants of skill and talent. By building up this network of obligations, she gained vast influence in the Guild. Her special protegees now travel throughout the kingdom, carefully advising and monitoring the work of those who serve under her. Most feel that she would be the best replacement for Nilhus should he step down, but her own loathing for Crux might prove a barrier to that. The smallest of the Painter Families, barely more than a single line and some cousins. They have a reputation as detail workers fashioning small pictures and miniatures. They maintain their place by being the family who has the made the most of their materials- continually developing new techniques and substances to make vibrant and sustained colors. They are also known as the family with the largest share of unfinished paintings. 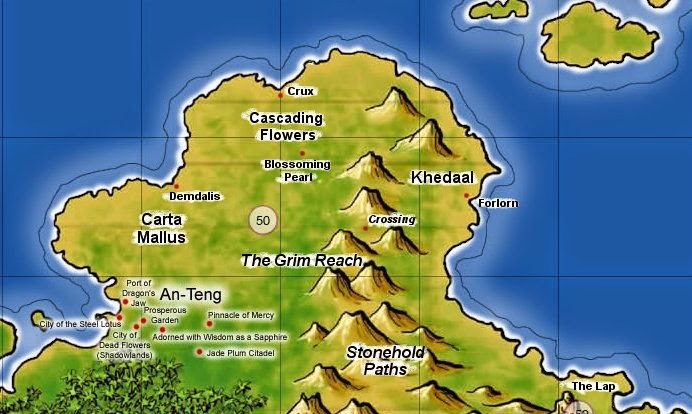 House Cathak has a strong interest in the satrapy of Cascading Flowers; they retain control over the neighboring satrapy of Carta Mallus and have a long standing dispute with House Peleps over Khedaal. Only in the last several years, however, has Cathak begun to expand its influence in this area. Traditionally they have been more interested in place where conquest could be obtained. This has been especially true in the Garel line of the family. The desire to hold territory of one’s own, kept in check by the Scarlet Empress has begun to fuel the ambitions of many young Dragon Blooded. As the most martial House and a strong contender to the throne, Cathak is likely to have many such upstarts in the coming years. Cathak Garel Night may be ambitious, but if so he keeps that demeanor closely concealed. He oversees Cathak trading interests in the kingdom from the Cathak House in Crux. One might see him as a simple trade agent of his family, but he is in fact an Exalt. His placement here is a visible gesture that the family means to have a say in what goes on. Night’s cousin, distantly, is Cathak Graves, the satrap of Carta Mallus. The two have visited each other on occasion but their relationship is formal. Night, by virtue of breeding and position, has a swirl of political and social influence around him. He gives parties and salons less often than other great nobles in the city, but they are always spoken of as noteworthy by the attendees afterward. Of the Water Aspect, him speaks deliberately and, as one might expect from a family of strategists, with caution. He rarely makes broad statements; instead he commits only slightly in conversation. There are several members of House Cathak present in Crux, but Night remains the quiet public leader of them. Owner of the Menagerie of Perfection. A seller of rare animals, including beasts of the plains, fish of the sea and reptiles of the air. Chail specializes in careful training and management for his creatures, but only sells animals small enough to be lifted by a man. The turning of the Dusk Quarter marks out a perfect day, or so the scholars claim. Certainly no one has noted a deviation even during the Calibration, when the rules change throughout the land. From most points in the quarter, residents can make out the Clock Tower a great marble obelisk that reaches up some 100 plus hands into the air. It lies at the outer edge of the city in the section called Charton. The marble is white, flecked with veins of silver. Once a year, cleaners are brought in to wash and polish its surface. Usually within a few months the soot and smoke of the underground begins to stain it. To match the tower, the masters of Crux long ago laid carvings high in the cavern wall. The four- set at the quarters of the day- allow the dwellers to get a fairly accurate sense of the hour. 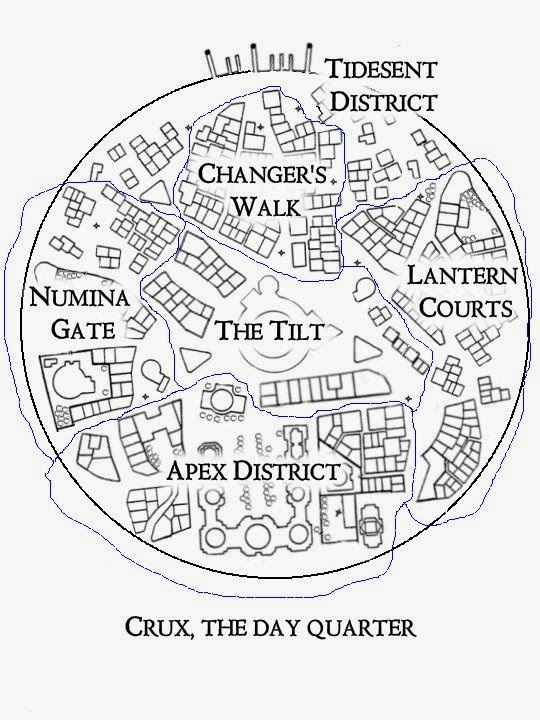 Long-time residents of the Dusk Quarter have their own slang for the times, based on where the Tower is at that time. Groups with a cause: political, religious, or even in support of gaming or sports heroes, will climb the tower under cover of night to hang banners proclaiming their devotion. Among rival groups, this can be used to count coup and win prestige. The Watch of the Dusk make sure to take down inflammatory or revolutionary banners quickly, but usually leave the more innocent ones up for a day or so. The punishment for being caught hanging a banner is a beating, unless the text is seditious. Then the punishment is limited only by the imagination of the Watchmen that find the banner bearer. Named by a sorrowful mother when his twin sister died in childbirth and generally rejected by his family, Coffin grew up under his uncle’s wing. That uncle served as a Guild Factor for some of the more unpleasant and illicit trades the Guild manages. By the time he was sixteen, Coffin had earned a great deal of money, but also had come to loathe this business. He turned his attention to the most legitimate businesses he could find, becoming patron to a set of metalsmiths, armorers, tinker and other such craftsmen. As time wore on, he became known as a strong advocate for these Artisans attracting more to him. Eventually with this power he was asked to join the Guild Council. He is known to have an intense dislike for Khopus Barge. Gateway is perhaps the most popular board game among the Dragon Blooded and the Patricians of the Blessed Isle. In the Threshold, high ranking merchants, scholars and nobles emulate this fascination. Among the populace, however, games of dice, cards and lots have more popularity. The Counting Lodge is a private house dedicated to the many flavors of Gateway. Built in a circle, the very center is open to the air outside, giving the interior the feel of an airy villa rather than a closed building. Tables for Gateway surround the outside, each carefully built at the proper angle to make up for the tilt of the city itself. The great jade inlaid board in the center of the interior plaza has two seats set for master and competitor, with the master sitting at the top of the tilt. Play on this board is reserved for those who have consistently scored well in tournaments, a reputation, or letter from a Gateway master or organization. Other boards surround this atrium, reserved for the more senior players. Others must play indoors. It is a great honor to be invited in to play inside and can be a demonstration of favor among the elites of the city. Membership in the Lodge requires a yearly fee and beverages and food can be purchased there. Observing Guests are welcome, if brought by a member, but must be properly quiet. The owner of the Lodge, Firewhite, is said to be an expert player but rarely plays in public. The last of the pre-campaign bits and pieces I distributed to the players. IN this one I wanted to set up the feeling of the tensions in the city. I believe this was the last thing I handed out to the players before the campaign began. A couple of thoughts about this campaign. One, I like the idea of handed out snippets before a campaign starts. Not a game bible, but little bits and pieces. I think perhaps I did too much work with this one, especially since a good chunk never made it to the table. I need to consider how to more tightly focus what I present. Two, I really like the idea of the PCs picking up the pieces and trying to restore honor to the idea of heroes. I think that's a compelling origin story for a group. And it allows the GM to re-build a setting if they want. I can imagine using Microscope to set up the groundwork for something like this. While Katrina was diverted from a direct landfall on New Orleans, the hurricane did damage across the Gulf Coast. In New Orleans flooding, damage to the levies and an inept evacuation plan exposed problems with local, state and government responses. However, squabbling over responsibility and money meant that by the following year, little had been done to fix the situation. Even before the disaster of Sunder, New Orleans had had a series of problems with sewage overflows, toxic mold closing whole neighborhoods, and an inadequate attempt to solidify the city's power grid. Sunder arrived in an already wounded city and created more havoc-- forcing a massive badly managed evacuation, flooding as certain primary levies were destroyed, and widespread physical damage. The year since then has seen some hopeful responses-- charitable organizations and churches working hard to provide for those left homeless, the restoration of many of the port facilities, and the re-opening of the Superdome. But the federal response has been weak, at nest. Much greater attention has been given to Boston and areas of the north. As well, money has been strangely disbursed with cash going to areas in Louisiana and neighboring states only marginally affected by the disasters. This has bred a degree of resentment and hostility. Here are a few of the current major issues facing New Orleans. "In recent years, the Orleans Parish district attorney's office has released hundreds of suspects under Article 701 of the Louisiana code of criminal procedure, which states that suspects cannot be held for longer than 60 days on felony arrest without an indictment. Reasons given for the lack of charges filed in 701 cases range from incomplete police reports to overburdened assistant district attorney's who were simply not able to file an indictment before the 60-day period expired. Unsurprisingly, the city's drug business began getting the message that felony crimes-even murder-would most likely end in a 701 release...In 2006 alone, there were nearly 3,000 such releases, a five- or six-fold increase over pre-flood levels." Sunder's assault only made the situation worse. In certain cases, especially those involving paranormal criminals, the DHS was able to step in and file new charges. However, this has meant the shipping of these criminals to detention facilities not unlike Guantanamo and charging them as terrorists. This controversial decision drew more negative publicity and overlooked the number of super-criminals who did manage to evade prosecution and imprisonment. Today's gang members refer to the practice as "misdemeanor murder"-- that a killing will likely only net them 60 days before they're released. Incredibly the mayor, police chief and others have managed to avoid addressing this issue or even talking about the inadequacies of the DA's office and other law enforcement divisions. While the South has always been stereotyped as corrupt, the scale of current problems in Louisiana and New Orleans cannot be overstated. While there are honorable public officials, it has become clear that they are fighting an uphill battle. Reconstruction finds have gone missing, projects implemented have had no oversight, and materials and supplies intended to help locals never reach their intended destination. On top of that a successful lawsuit by employees of the New Orleans District Attorney's office for racial discrimination in their firings may cost the city several million dollars. The DA office has told the city council that if they do not cover the costs of that suit, the office will have to even further curtail prosecution activities. Another serious problem has been terrible management in the offices handling building permits and city planning. Complicated paperwork and regulations have made it increasingly difficult for homeowners to rebuild and return to the city. While some claim the steps are necessary to prevent future disasters, recent reporting by the local newspapers has suggested a pattern to the roadblocks-- with certain neighborhoods targeted for more rigorous inspections and increased delays. In turn, these properties have been snapped up by other buyer-- some with suspicious backgrounds or clearly operating through dummy operations. Accusations of corruption have also been leveled at the groups deciding where redevelopment will be permitted and where they land will simply be leveled. As a result, New Orleans remains at a population of less than half of pre-Katrina and Sunder. All of this has left an open space that has been filled by various criminal groups. The Hurricane Mafia, so-called because of their connection to post-disaster reconstruction projects throughout the south, is said to have heavily invested in making this city a new power base. As well due to the high port traffic, it is believed that certain Chinese Triads have been making a play for increased influence. Many of these gangs have strong establishments in Brazil and other South American countries and are making that a jumping off point to reach this entry into the US criminal network. But homebrew organized crime has also spread. Perhaps most notable of these are two gangs. The first, Brick 14, began to grow after Katrina. Popular legend has it that the leaders of this gang were left to die when authorities abandoned a local jail. Housed in Block (or Brick) 14, they managed to survive and escape. Their influence has grown and they've managed to push out other gangs-- many of whom had members flee during both disasters. When those criminals returned they found themselves faced with a choice of joining up, leaving, or getting killed. The other prominent gang, B-Zerk, is has more questions surrounding it. It has been suggested they are tied to another criminal organization or that they have some super leading them. Little is known about them besides their penchant for highly visible violence. "Perhaps the most serious blow to New Orleans' ailing criminal justice system is the recent election of former Republican Congressman Bobby Jindal as Lousiana's governor. Mr Jindal has boasted that he will turn New Orleans-which is already profoundly suffering from a lack of public resources-into a model of far right privatisation politics on such issues as education and healthcare. The Department of Homeland Security has selected New Orleans as the site for national conference entitled, "Security and the Parahuman: Issues and Options." Dedicated to developing a coherent national blueprint for handling parahumans, it agenda will consider risk management, liability, and terrorism. Scheduled for the first weekend of April, 2008, the conference is the first of its kind to draw across many fields including governors, law enforcement, scientists and others. "New Orleans should be a stark reminder of the problems with face in America," stated conference organizer and deputy FBI chief Moses Barks. "We hope the backdrop of this city will encourage participants to take the need to develop policy seriously." The New Orleans Sewerage and Water Board announced today a second boil warning for residents in selected parishes. Following the collapse of a set of major feed pipes, the board has had to divert resources to maintain pressure. As a result a certain amount of untreated water made its way into the water supply. Officials estimate that water should be safe to use within 48 hours. This is the second major water incident in the last two weeks. Some officials have begun to question the competency of the NOSWB. There have been further calls to privatize other facilities under the board's control, despite previous problems with corruption in that area. In 2001, AquaAlliance, a wastewater treatment company was convicted on ten counts of bribing officials in return for preferential treatment in the bid process. Water and wastewater treatment are two primary needs of people in a community, so in addition to everything else you need to do, you have to have that capacity in place before can rebuild," says James N. Jensen, Ph.D., professor of civil, environmental and structural engineering and director or the environmental science program in the UB School of Engineering and Applied Sciences. Jensen estimates that there were probably about 100 million gallons of wastewater in the system in New Orleans when Sunder shut the city down, and he says the EPA estimates that 200 wastewater treatment plants and 1,100 drinking-water facilities in New Orleans were affected by the event. The City Council approved increased funding for the NOPD Cybercrimes division after a series of well publicized crimes. The break up of a major organized identity theft team operating out of St. Bernard Parish in May brought the first attention to the topic. That the criminal had managed to operate through Sunder's assault and keep up their infrastructure despite the devastation to the parish around them have made police nervous that other like criminal cells may be operating in areas given less attention. As well, the discovery last week of a fourth victim of the so-called "MySpace Killer" has caused additional outcry. Cybercrimes division chief Natalie Deveraux said that the money would go towards improving the group's operations in terms of personnel and more advanced equipment. Adams Braeburn broke ground on his latest project, an advanced Marine Research and Development facility in Plaquemines Parish. The facility will look at the changes to marine life in the Gulf Coast region, the impact of local environmental shifts, and research new technologies and techniques to make use of the local marine resources. Located in a remote area cleared by damage from Katrina, the facility should eventually provided 100+ jobs for the local area. "Eventually as we expand our vision, we hope to employ even more locals," said Braeburn. This project represents the sixth groundbreaking for the noted developer-industrialist since he came to New Orleans. Despite having been Boston-born, Braeburn came to New Orleans after Sunder's assault to offer aid and commit money and resources to the redevelopment of the city. "So many people have turned their back on New Orleans, but Braeburn Futures will not." Or rather I loved Wolverine but then I came to loathe what he did to superhero RPGs. I’m old enough to remember reading my sister’s copies of X-Men during the Dark Phoenix Saga. Wolverine took on the Hellfire Club and won. It was badass and I loved it. I religiously followed Frank Miller’s ’82 Wolverine mini-series blending ninjas and samurai honor even more deeply into his backstory. It was awesome and he was brutal, not like other wimps. But he was a hero with knives on the back of his hands. It was some time before that started to seep into games. In Champions we’d almost always taken as a given that players would take “Code Against Killing” as a disadvantage. Even if they didn’t- it was understood that killing wasn’t what heroes did. We weren’t playing Murderhobos- that was for D&D and those kinds of games. Killing was bad. It crossed the line. It changed things. If it happened, it had to be a dramatic moment- a testing decision for everyone involved. Then Dark Champions appeared and introduced a new disad- “Casual Killer.” That didn’t kick things off- no, it had already been brewing in the games. Killing had become cool in some campaigns- the easy way to settle things permanently. Not for all games, but enough that you could tell things were shifting. After all when you’re players, you’re problem-solvers. And actually putting a freeze blast in the Joker’s head pretty much solves the problem. Comics and games in the 1990’s joined forces, with the Iron Age brutality and new RPGs blending together. While fantasy games had alignment systems, superhero games relied more on optional player-selected limits. It’s interesting to consider how superhero systems deal with morality. Do they have rules about that or is a code of conduct just assumed? What kinds of consequences exist- social, mental, character sheet, or otherwise to represent this? Does the setting have a particular moral inflection (Underground vs. Marvel Supers) or is that deliberately ambiguous (Godlike or Aberrant)? I think defining that stance is hugely important for a supers GM. Some find the idea of four-color restrictions limiting, some don’t want heroic action valued over other types, while others really need a moral compass in the game. Just a reminder, this post is part of my new Patreon project. If you enjoy these lists please check out my Patreon page. Even if you don’t support it, please consider sharing it and spreading the word about this. These lists cover a smaller slice of time than my past rpg lists. I hope this makes them easier to read. As we get closer to the present the lists expand and contract weirdly. I include mostly core books, but also significant setting or sourcebooks. Given the number of great things published I haven't included everything I wanted to. I list revised editions which significantly changed a line. Generally I only include published material- print or electronic. I leave out freebie or self-published games. I'm sure I've left something off without adequate reason; feel free to add a comment about a line I missed (if published in 2009). I've arranged these by year and then alphabetically within that year. 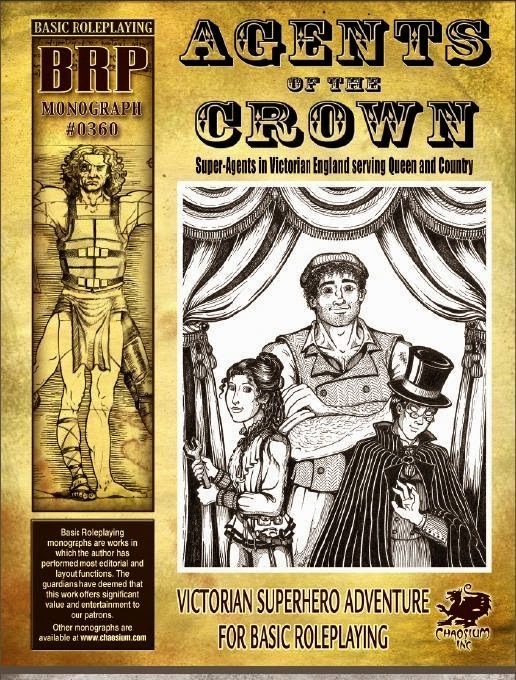 As I said on my Victoriana list, Agents of the Crown suffers from coming out the same year as The Kerberos Club IMHO. 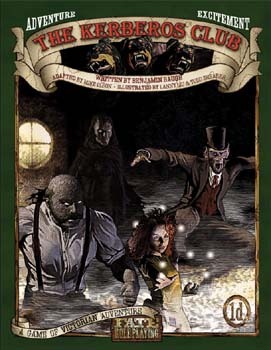 A Victorian-era superhero supplement for Basic Roleplaying, this campaign setting borrows liberally from League of Extraordinary Gentlemen. The players serve as super-powered operatives for the British Crown. The volume's fairly light, but would be at least a good starting point for GMs thinking about supers in the period. It has the added advantage of using the BRP system which many players know through Call of Cthulhu. But it also has awful full-page grey water-markings. Reading the pdf is a chore, a problem I’ve seen with several Chaosium supplements like this. The game itself leans to low-powered heroes more in keeping with the fiction of the period. Perhaps this might be proto-pulp? Pick character creation. Various dice resolution. 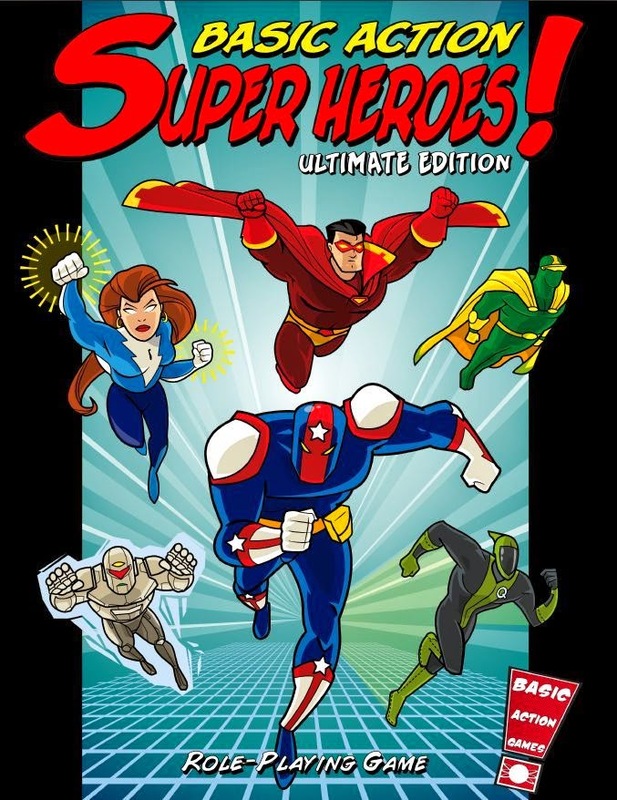 On my 2004 list I missed the first edition of BASH- Basic Action Super Heroes. I don't feel so bad because BASH 2e deserves all the attention. It’s a brilliant little game with a simple and clean art style. If you make your game echo the designs of Batman TAS or Justice League Unlimited- without just tracing the characters- then I'm hardwired to like your game. BASH combines consistent visuals with effective layout and text design. It has some bells & whistles, but favors functionality over other elements. BASH uses a simple exploding 2d6 roll multiplied by a stat or power and then tested against a difficulty number. That has a nice feeling of scale- which reminds me a little of DC Heroes or FASERIP. Characters are built on a relatively modest number of points: 40 for a world class hero (I guess that would be something like PL12 in M&M or 250 pt. in Champions). The game comes with a solid list of powers broken down into seven categories for easy reference and connection. Players can also buy advantages, but only by taking an equal number of disadvantages. The system feels fast and fun- with an emphasis on transparency on the GM's part. The combat rules still have enough crunch to offer some extra options. I also like that the vehicle and gadget system doesn't bog the game down. I hadn't paid any attention to BASH prior to looking through this, but holy cow this is an excellent set of playable rules. The GM section, which takes up about half the book, is equally solid. It has a nice assortment of random tables, advice, sample adversaries, ideas for settings, and optional mechanics. Plus it has an index. I will seriously consider this for running light and fast supers games. Basic Action Games has released a number of supplements for BASH including the Awesome Powers series, Comic Character Cavalcade, and Crook Book #1. Point buy. 2d6 Resolution. Here's an odd one, though not for the usual reasons. 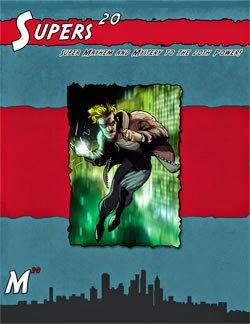 Comic Book Super-Heroes (second edition) is another d20 supers game built on the d20 Modern OGL. Players pick one of eight possible classes defining either origin (Gadgeteer, Magician, Alien, Artificial) or power type (Physical, Mentalist, Energy manipulator, Extraordinary). I'm used to one approach or the other, rather than mixing them. Within those classes, players get "Super Points" to buy & increase powers and improve rolls. The classes set limits, give special features, and offer a choice of vulnerabilities. The structure itself doesn't look too bad- and there's a decent list of powers. But it feels like just another d20 adaptation and approach. CBSH doesn't offer any world setting or background. d20 Gamers looking for a vanilla system may want to check it out. The weirdness came when I tried to find out more about the game and company. The publisher, The Le Games, doesn't seem to have a website anymore. Instead their links lead back to HeroClix World. I assume the company shifted over to that at some point. They still sell a hodge-podge of d20 products through DriveThru rpg- including the Unorthodox Series series. I also found this apology from the company for posting sock-puppet reviews. I wonder if that explains the relative scarcity of reviews for this product? Level and class. Various dice resolution. A few items this year fall at the edge of my definition of superhero. Thrilling Tales 2e revises this classic pulp adventure rpg to Savage Worlds. There's a lot to love there and if you wanted to do a masked adventurer '30s & '40s game, you could do worse than this. Thrilling Tales offers a solid, one-volume approach. For me it’s a toss-up between this and Pulp Hero as the best resource for the genre. Another solid genre-emulation book is Green Ronin's Mecha & Manga. I've listed anime-style books on these lists before (Sailor Moon, Bubblegum Crisis). This sourcebook offers ideas for how to adapt M&M to these tropes. It doesn't add much in the way of new mechanics, but instead talks about what the games should feel like. It is ambitious and perhaps takes on too many ideas for the book’s size. One last game is an even further reach. We've seen rpgs with modern mythological heroes (ala Scion). And classical myths inform many supers (Wonder Woman, Thor). So perhaps something like the ancient heroes of Arete might be proto-supers, just like Pulp heroes? Perhaps not. This is a crazy year for Wild Talents, with four distinct and impressive setting sourcebooks landing. That’s an interesting publishing approach. Rather than build on Wild Talents’ established setting or even the precursor Godlike material, Arc Dream chose to follow up with multiple new ways to play. The approaches read like thought-experiments and eCollapse makes that explicit in its introduction. Here Greg Stolze wants to explore choices and defining ‘good guys’ versus ‘bad guys’. You can see the seeds of his later Better Angels; he mentions wanting to do a setting based on the behavior of supervillains. eCollapse presents a near future, post-crash society. It isn’t exactly post-apocalyptic, but more just that everything’s kind of crappy. Slackers, economic decay, erosion of liberties, environmental pollution, full-on surveillance state, etc. But on the plus side, biotech superpowers are readily available…though with some non-monetary costs. The power list is interesting, tightly defined, and full off traps for the unwary player. That’s combined with player-chosen weaknesses and ideologies (what you’re for and against). These deeply flawed characters then strive against the background of this dystopian future- trying to figure out what they stand for and what’s worth actually sacrificing for. 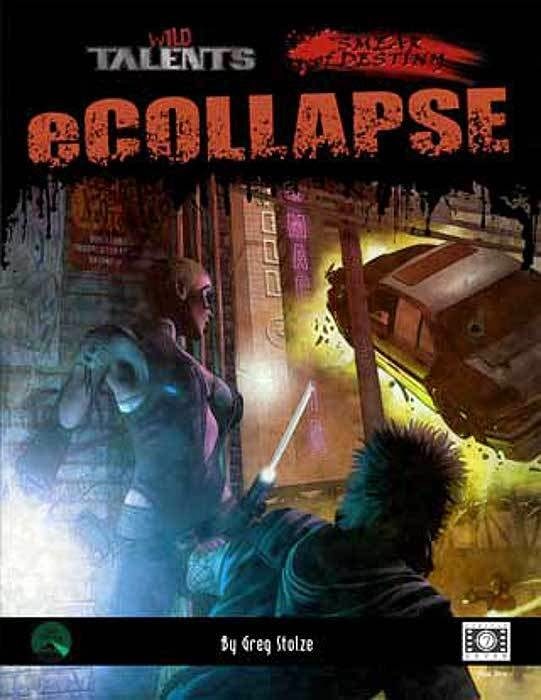 eCollapse borrows a little from Cyberpunk, but feels closer to Underground (with less goofiness and attitude). The rules include an alternate approach to resolution for those who don’t want to deal with the crunch of Wild Talents. Called “Smear of Destiny,” these mechanics sit just atop the main ones in the book. There’s also a substantial section at the end with a full explanation. Unlike some dual-stat books, one system doesn’t get in the way of the other. Smear of Destiny uses a deck of playing cards for competitive narrative resolution, with the red and black of the suits mirroring the question of black and white in the universe. That’s smart given the dramatic focus of eCollapse. A solid setting sourcebook for those wanting a near future and/or darker spin on supers. I have, perhaps, written before of my love for all game things penned or co-penned by Ken Hite. 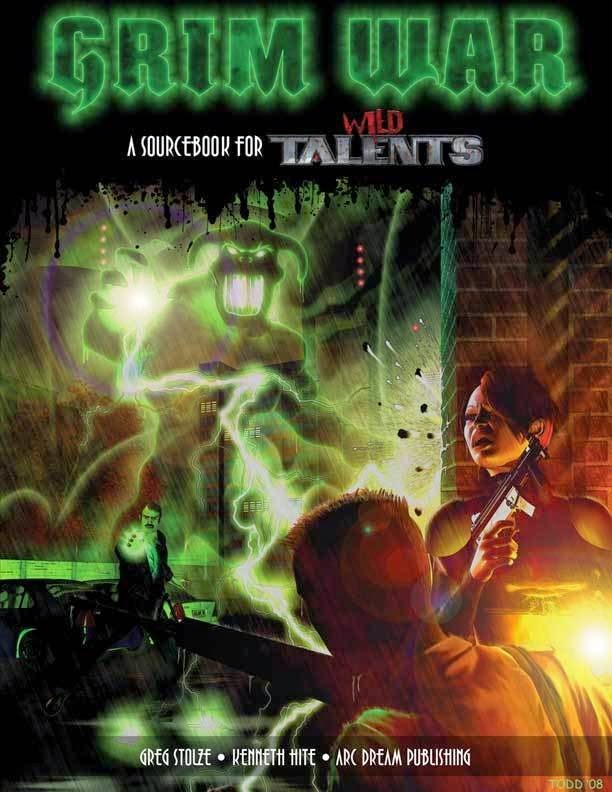 This Wild Talents setting sourcebook combines his talents with that of the excellent Greg Stolze. And it is insane. Not necessarily in an awesome way, though it will be for some, but in a gonzo crazy “is this really an rpg product?” kind of way. In Grim War you have your usual superpowered mutants, but you also have sorcerers. That’s cool- and common in supers settings avoiding a fully sci-fi approach. The Marvel and DC Universes have that going on. But this isn’t a case of having power blast and slapping a magic descriptor or FX on it. No. You have a whole section on invoking spirits and demons (which players can chose to call upon, control, or actually play). Then there are the spells- each of which has an incredibly specific and colorful requirement like crawling in a straight line non-stop for a day and moving aside carefully any living thing which crosses your path. There are mechanics for building new spells as well, with guidelines on how make them just as over the top. Add to that the use of the Company-rules from Reign, with the idea of players managing and battling other factions. The non-mechanical sections of the book cover multifarious cabals, orders & societies; a wide range of potent NPCs; and plot hooks for actually putting all of this into play. I think this can best be described as Unknown Armies meets Aberrant. If you’re looking for a complex supers plus Delta Green or secret world gone mad game, consider checking this out. If you're selling me a supers setting book you probably have two approaches. On the one hand, you can hook with me with your cool and distinct twist (Bedlam City's Iron Age sensibilities, Adventures Into Darkness's Lovecraft-inspired weirdness). On the other you can offer me a plethora of supervillains and characters (Century Station). If you can do both, so much the better. But half-measures don't interest me as much. Halt Evil Doer 2.0 positions itself primarily as a campaign setting with a supers history stretching back to the Victorian era. I don't think that's a great stand-alone pitch. If a fantasy setting simply sold itself on having a long timeline, it wouldn’t grab my attention. The back cover of the HED has the following contradictory blurbs: "A World of Heroic Adventure" and "A World Where Sometimes the Villains Win." I'm not sure what we're supposed to take away from this- is it a darker and grittier setting or a more pulpy world? But all is not lost. HED 2.0 offers up of about 60+ pages of history, world presentation, and backstory; that’s stuff I’ll probably skip. But that's followed by about 150 pages of heroes, organizations, and villains. Some of them are pretty embedded in the setting, but they’re still useful. I always love more ideas for bad guys. Here’s the third and final (for now) version of Judge Dredd done for rpgs. It comes from Mongoose Games who also did the previous d20 version. This time they opt to repurpose their particular flavor of the Traveller engine to suit the game. Traveller's fairly lethal, which might change the feel of play. There's some weirdness with this game- as Mongoose’s own web site doesn't do a very good job of making clear what's available for it versus the d20 version. The latter is OOP but still available as a pdf, but the former is buried among the Traveller products. This version of Dredd also requires the Traveller base book, though apparently you can get by with the digest version. I'm assuming that Mongoose has reworked the Dredd-verse material from the earlier edition and added on to with this. They're been pretty good about that in the past (witness the reuse of material from Runequest to Runequest II to Legend). In any case, gamers interested in Judge Dredd will find this the most available version right now. Though not greatly supported, I imagine Mongoose will keep it kicking around for some times. Plus MGP has doubled-down on the property with Judge Dredd Miniatures Game. That's nice since it offers additional figures and resources for play. Pick and random character creation. d6 Resolution. Another supplement I already covered on my Victoriana lists and one I really love. The Kerberos Club presents incredibly well thought out Victorian superheroes. The set-up has an internal consistency missing from other games. The Kerberos Club of the title is a patron group which brings together people with unique talents and abilities. They stand outside society, protecting it. There's a nice dynamic of cooperation and opposition between the club and the powers-that-be. The book offers ideas and background for running a campaign in the early, middle, or late Victorian era. As a supers book I love it because it bravely doesn't go the route of quiet, low-powered beings in a Victorian setting (ala League of Extraordinary Gentlemen). Instead we get full-on earth-shattering superbeings changing history and wreaking havoc. Add to that a supernaturally-empowered Queen Victorian and you have a recipe for awesomeness. If you have players reluctant to do Victoriana because of the restraints of conventions, consider this game filled with collateral damage of the physical and social kind. I highly recommend this as a game and a readable resource on the era. It may not be as detailed as some others, but it is a pleasure to work through. The world-building on display here is excellent and wrestles with some of the implications of having women, non-humans, and "ethnics" with powers operating in this culture. The FATE version of this is especially good (and complete), but there's also a Wild Talents and a Savage Worlds version you can buy. You can read more of my thoughts on this here. Variable- multiple systems. We lived in Mexico City when I was very young. I don't remember much & I've lost all the Spanish I once knew. But I have strong memories of black & white TV shows and Luchadores. I flashed back to those later the few times they showed the Santo films on the low-budget Channel 44 out of Chicago. I love the idea of the masked wrestler - heroic and weirdly worldly, hiding behind the guise of simple sports. I never got into Pro Wrestling as entertainment, but I loved when I saw characters like Rey Mysterioso. I cheered at Angel's The Cautionary Tale of Numero Cinco episode and ¡Mucha Lucha! on the KidsWB. Is it superheroes? It is for me: stories of masked characters fighting villains. Mind you those villains are more like bad monster movie foes, but it works for me. It’s garish, weird, and inconsistent and I love it. 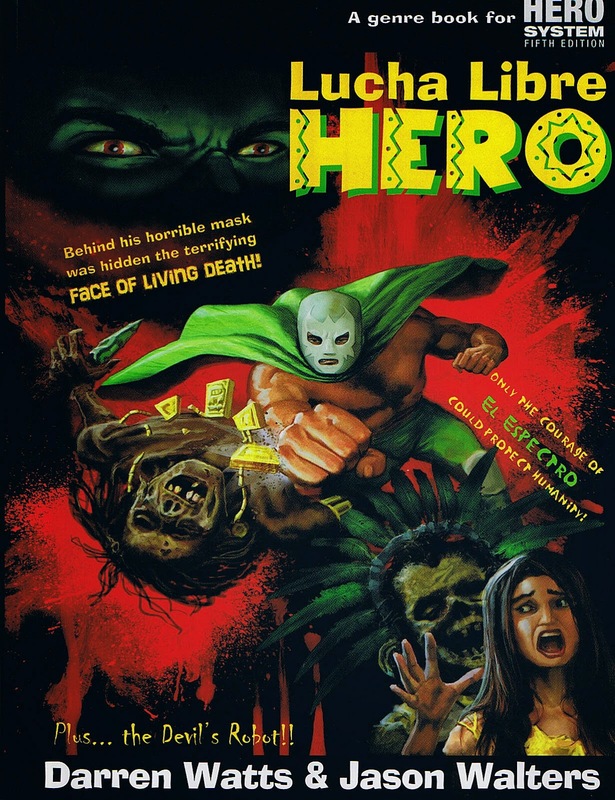 The authors of Lucha Libre Hero love it as well. They've created a game and a sourcebook covering the whole Mexican masked wrestler genre. Like PS238, LLH comes with a complete and streamlined version of the Hero System. That takes up about 40% of the book. Another 20% presents one of the craziest and most in-depth approaches to niche martial arts I've ever seen. I've always enjoyed MA in Hero System and this section goes absolutely crazy with 150+ maneuvers (Anaconda Vice to Frankenstein Death Swing to El Tornillo). Add to that the awesome "Stunt" options like 'Evil...I Can Smell It,' 'Don't Touch That,' 'Terror of the Underworld,' and many more. This is an amazing and detailed approach to a fairly cinematic genre. If you like crunch you'll find it here. On the other hand even rules-light folks (like myself) will discover rich ideas to lift and adapt. The remainder of the book gives a guide for running Luchadore campaigns: the history of the genre, bibliography, ideas for tone. There's an impressive section of NPCs and a whole campaign outline with an adventure and a brief take on weird Mexico City. I love the way the game mixes classic wrestling rivals, supernatural foes, and mad science. The art's great and fits the material. 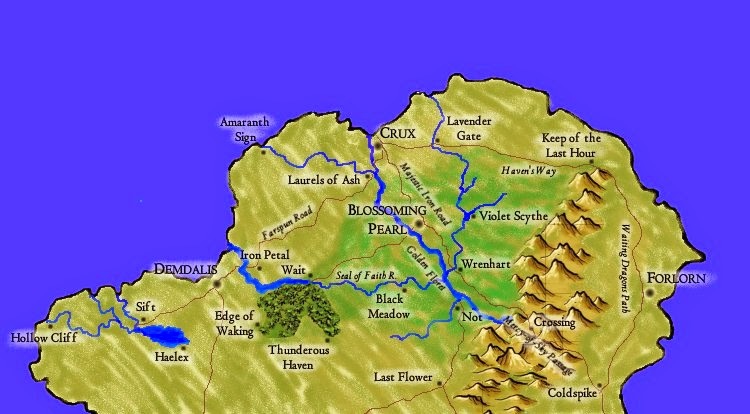 Perhaps the only drawback lies in your players' knowledge of the setting. I was a little surprised when I talked about Luchadors with my group and only one or two of them knew what I was talking about. I should also mention another Luchador game which also came out in ‘09, Luchador: Way of the Mask. It seems a little more focused on the wrestling life, but the line has gotten some support (Luchador: Painted Honor, Luchador: Disciples of the North, etc). Point buy. d6 Resolution. This game is a moving target. This first edition arrived to some pretty bad reviews based on system, layout, and editing. 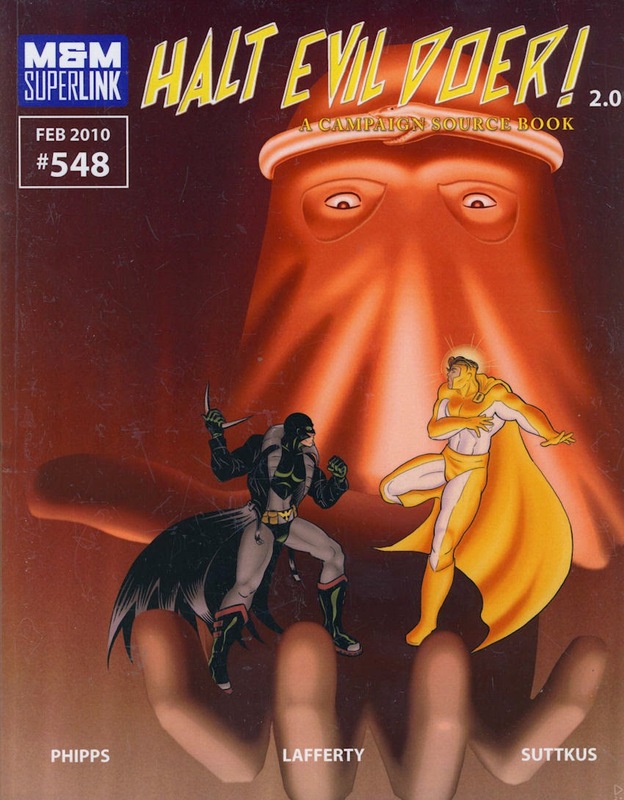 The following year Super Crusaders II popped up, replacing the two-book version with a single volume. That completely changed major elements of the game. 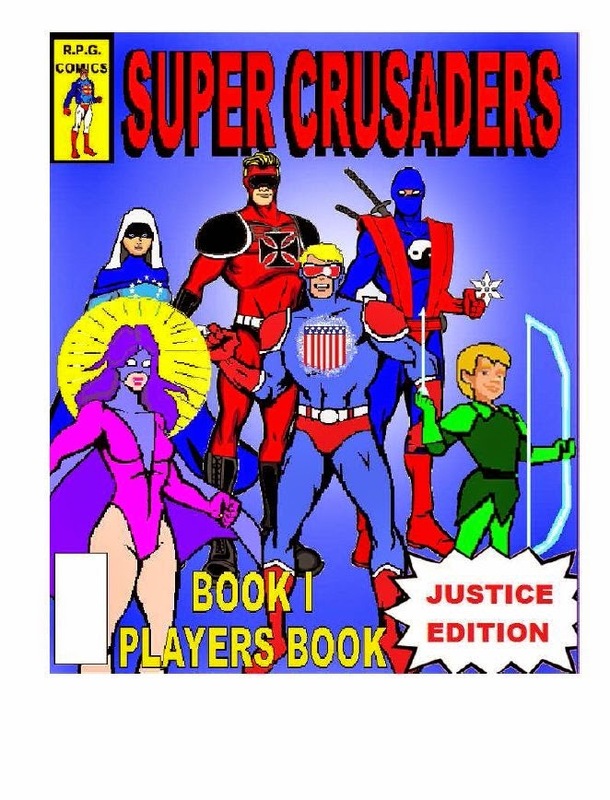 Then in 2013 designer Lee Walser released another version, Super Crusaders III with still more changes. You have to admire the work there- continually revising and redeveloping a small game like this. For purposes of this blurb, I'm going to focus on the most recent version since the others have vanished down the memory hole. Super Crusaders offers a stand-alone supers game, without a specific universe. I've read through the rules a couple of times and I still don't get exactly how things work. Character creation is very loose- with players simply picking some powers. Origin affects this a little. There's a strangely board-gamey feel to how actions are presented, with classes of things broken into Arm, Eye, Leg, and Mind. The basic mechanic is a variable number of d6 rolled against a target number. SC does offer a powers list along with ideas on how to tailor them. It has a few interesting mechanics (certain powers can only be taken by NPCs), but overall I'm not sure what new ideas it brings to the table. The art and graphic presentation undercut the game as well, with weak MS Paint-esque graphics combined with clip-art icons. I had heard that Super Crusaders had a strong religious element. That's true, but it isn't overwhelming. I do like that we get another perspective on the tropes. The designer dislikes/disputes the idea of superheroes as science-fiction. That's not a position I've seen taken up in other supers rpgs. His faith comes through in places, particularly in his discussion of heroic tropes and his own campaign world's history. In a couple of places it is fairly explicit, "The superhero genre is about the struggle between good and evil. It deals with the mysterious and miraculous in a symbolic way. Anyone who doesn't realize that superheroes are really about religion, just isn't paying attention." Your reaction may vary. Super Crusaders does have some supporting materials, including Knights of Saint George, Minions & Monsters, and The Equipment Book. Open pick generation. d6 Resolution. A densely-presented supers sourcebook for the Iridium System. It presents a near-future setting of 2033 where corporations have developed genetic modifications to create superbeings. The game sets itself up to be a battle between those corporations and the PCs, but with conflicting agendas and political views. There's more than a little feeling of Strikeforce Mortui here- with the PCs accepting powers in exchange for submission. While the premise is interesting, the game book does a terrible job of presenting it to the readers. There's so much information here, but Supers Inc doesn't stop to really explain what the game's actually going to be like: what do you do in this setting? what does a campaign look like? Again, I understand the impulse to present a sandbox, but some callout material, early on, talking about what the game can be would really help. Supers, Inc has some neat concepts and gamers considering a slightly dystopian supers game might want to look at it for ideas. In 54 pages we get background and characters (14 pages), mechanics and stats (22 pages), an adventure (12 pages), and cover and fluff (6 pages). The book includes a highly compressed version of the Iridium Core Lite rules. Players spend points to buy stats, skills, and powers. Resolution works by rolling a d20 under their relevant skill+ bonus number. I think Supers, INC could easily be expanded- both in material and page count to give this game room to breathe. As it is, despite the density it doesn't feel like there's enough here to power a compelling campaign. Point buy. Various dice resolution. Modern20 is RPGObjects reworking of the d20 Modern system to support a faster and more cinematic game. It streamlines some systems and ties advancement to achieving story goals. Supers20 takes and reworks the concepts from '02's Vigilance: Absolute Power (mentioned on the earlier list). It does away with several elements including power points and stunts. Supers20 builds on the Modern20 framework, using the occupations from those and adding some new ones. I especially like the idea of the "Super Team" class. Your characters has been raised in and trained with the idea of working with an established group (think Fantastic Four, or perhaps Astra from Astro City). Powers are represented by feats, which can be modified by use of the Power Control skill. At only 56-pages, Supers20 packs things in. Most of that covers the powers, but the last third offers advice on genres and campaigns. Useful for d20 aficionados. Various generation options, class and level advancement. Various dice resolution. The last of the Wild Talents settings on this list, This Favored Land offers secret superheroes during the American Civil War. In the same way that Godlike considers the implications wartime supers, TFL puts them in the context of this period. In this world a simultaneous and unexplained vision appears to people across the land. Later these same people become possessed of strange powers. The books offers an interesting framework, but leaves enough room for the GM to shift and develop their explanation. There’s even some discussion of how to connect this with Godlike to form a continuous narrative. Enthusiasts of Wild Talents will find some interesting mechanics (about as much as eCollapse, but less than Grim War) which might make it worth picking up. The designers present solid and rich material, worth reading for anyone interested in running a game in this era. The game takes place solidly during and around the Civil War, unlike most Westerns. It has a ton of material on the conduct of that war, the timeline of the era, and the general society. There’s a modest presentation of different campaign settings and ideas on how to handle historical change. It also has a decent introductory scenario. Like everything I've seen from Arc Dream, you can dive into this book and mine all kinds of ideas. Recommended for Wild Talents experimenters, ACW gamers, and GMs who want to look at the presentation of a novel supers concept. This is what I wish the 80s and 90s had been like for flag heroes in superhero comics. This is the Iron Age that never was. This was a time in comics when Captain America, Union Jack and Captain Britain were side-by-side facing down their spandex-clad Soviet opposite numbers across the Berlin Wall and engaging in a shadow war of a super-powered covert adventures. For me it’s a campaign that could only be drawn by Jim Steranko . The Wargames series includes some single, Cobra-like foes (General Venom) and two other major releases. Wargames 2: Superspies and Commandoes of the Cold War covers has agents and organizations, some of which resemble Saturday Morning freedom fighters. Wargames 3: Sentinels of Berlin presents a superhuman militarized Berlin and the cast of characters struggling for hearts and minds there. 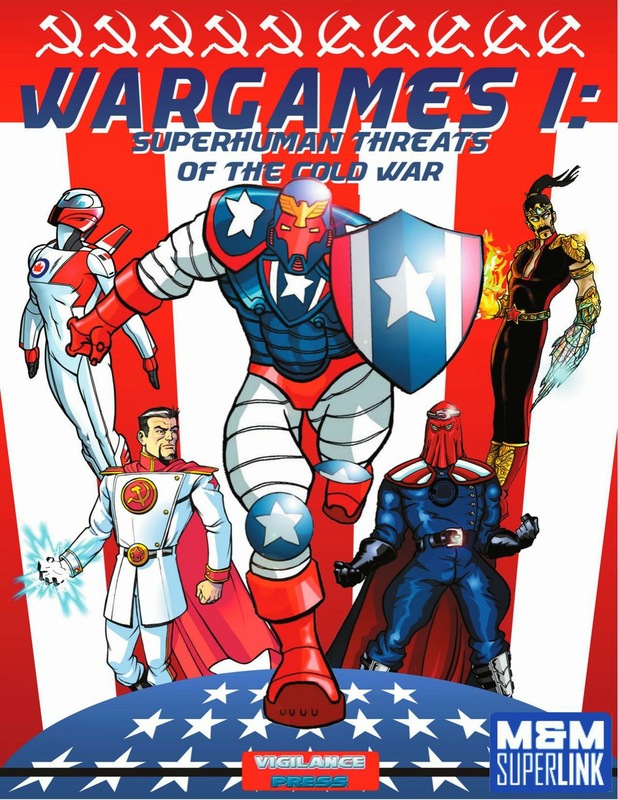 In 2011, Vigiliance Press revised some of the material in a version for Icons (Wargames 1: Superhero Roleplaying in the Last Days of the Cold War). Wargames is a neat and ambitious setting- and I can easily imagine using this as an alternate dimension in an existing campaign.